The course consists of fast and flowing sections with some tight and twisty sections to challenge your skills. The course is approximately 7 miles long and is ~70% single track. Course map. Racers who do not already have a valid Oakland County Parks motor vehicle permit will be required to pay a $5 parking fee the day of the race. This fee can be applied to the purchase of a 2016 vehicle permit. Racers arriving by bus will be charged per-bus, at a rate of $1 per occupant. 2015 race results are available from Newton Timing & Race Services: Elite/Expert, Sport/SS/FB/Tandem, Beginner. Registration day of the event will be available for an additional $5. Registration opens at 8:30 am, and closes 30 minutes prior to each race. What: Kids race will consist of a special short loop around the spectator area. Registration: Cost is free, but you must sign a waiver at the registration desk. Each racer will get a number plate and a medal. Would you or someone you know like to support CRAMBA-IMBA by being a sponsor of the 2016 Addison Oaks Fall Classic? Please contact us @ race@cramba.org. To guarantee size, pre-order your shirt by September 6th. No guarantee on sizing for day-of purchase. 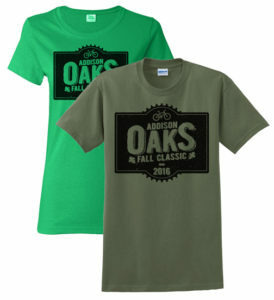 Shirts are $20 with online registration. The day-of price is $20. CRAMBA-IMBA water bottles will also be available for $5/each. Free (for racers) brats, hot dogs, burgers, or veggie burgers. Non-racers are welcome to enjoy the food, but we do ask that you consider donating to CRAMBA-IMBA to help offset our food costs. The grills will be lit and food available after 12:30 pm. Medals will be awarded to the first 3 finishers of each category. This entry was posted in Chapter News, Event. Bookmark the permalink.